California – This sunroom has a special split-level design that helps flood the interior with lots of natural light. Conservatory – This sun room is modeled after classic European architecture. It is available in either an Edwardian (square) or Victorian (faceted) style. 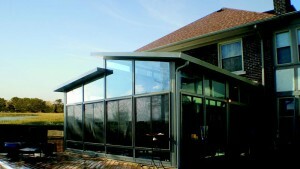 Solarium – A Solarium sunroom from TEMO features full glass walls and a glass ceiling for maximum sunlight penetration. Walls Only – Choose this option if you have a pre-existing screened-in patio that you would like to enclose with windows for the purpose of year-round enjoyment. Studio – The Studio is the most popular of all the TEMO sunrooms. It works equally well with one- or two-story homes, and is configurable with one, two, or three walls of windows. Cathedral – This sunroom has a vaulted cathedral-like ceiling that creates a more open feel. If you would like more information about having a TEMO sunroom added to your home – be it a split-level California, a dramatic Cathedral, or any one of the other models we offer – contact U.S. Patio Systems and Home Remodeling today. We are a TEMO sunroom dealer serving St. Paul, MN, and the entire Twin Cities region.